Posted in Desserts, on August 29th, 2015. If a CRISPY crisp is what you like, you’ll not be disappointed with this one. 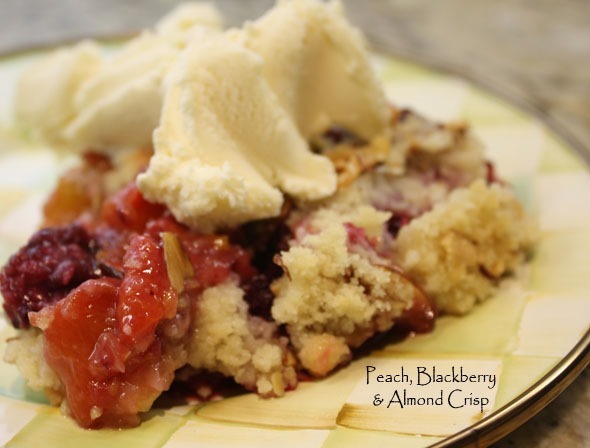 A layer of peaches and blackberries on the bottom and the topping (crispy, but no oatmeal) sprinkled liberally on the top and baked. Wonderful! A few months ago I purchased another cookbook. I’m a sucker. I’d read that the book was so worth buying and very few of the recipes have shown up yet on the ‘net, so I decided to spring for it. Rustic Fruit Desserts: Crumbles, Buckles, Cobblers, Pandowdies, and More , written by Cory Schreiber and Julie Richardson. I had a big crowd over for dinner recently – it was a cool evening (although ever-so humid what with this oddball weather we’re having) and I even lit the outdoor fireplace for some of the younger dinner guests. Anyway, I bought a small flat of peaches (not nectarines) and we generally don’t find boysenberries at our markets, so I bought blackberries instead. Otherwise I followed the recipe. Since I used peaches, I peeled them. I have a great Messermeister Pro Touch Swivel Peeler that works like a charm on soft fruit. The recipe calls for tossing the fruit with cornstarch and a dash of salt. I thought the fruit was sweet enough, so I eliminated the 1/2 cup tossed into the fruit. I’ve noted it in the recipe as optional. 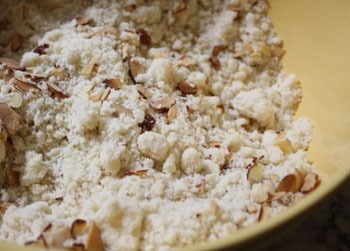 The topping is easy to make – you combine everything (adding in the sliced toasted almonds later) in a food processor (or do by hand if preferred) and once out into a bowl you kind of manhandle the dough until it makes shards or clumps and that are sprinkled all over the fruit. Down below you’ll see photos of the Pyrex dish with just fruit, and then with the topping. I increased the recipe to feed more people, so ended up baking it in 2 different dishes. 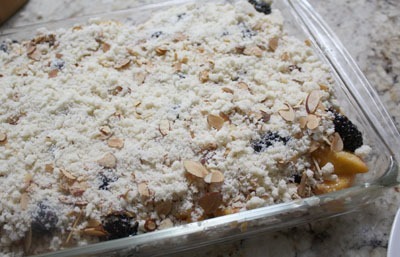 One of the suggestions was to bake this in flatter, wider dishes so the moisture from the fruit will do some evaporation and so the topping will have plenty of space to “crisp.” That’s what I did. The crisp is baked for 55 minutes (the recipe says 45-55 and the tops weren’t quite brown enough so I baked it the full 55 minutes). Ideally, serve this warm – you can reheat it for 10 minutes at 325° if you make it earlier in the day. I served it with vanilla ice cream. But, when we had left overs, I served it at room temp 2 days later and it was just fine. What’s GOOD: this recipe is a real keeper. I LOVED-LOVED the crispy topping – and especially because it contained no oatmeal. I’ve never been a fan of oatmeal crusted cobblers. So I really liked this topping which IS crunchy and tasty. Really liked the almonds in the mixture too (toasted prior to baking the crisp). Altogether a delicious dessert, and it wasn’t all that much work to make. Peeling the peaches wasn’t a whole lot of fun, but the peeler makes it pretty quick work. Nectarines don’t require peeling, and peaches probably could have been left unpeeled. Your choice, I guess. What’s NOT: The blackberries I used were huge, so their seeds were quite large (chewy). If I had anything to complain about it would be that – and that’s not the fault of the recipe, just the fruit selection. I’d choose younger blackberries, or substitute raspberries. That, however, was the only thing I could possible comment on. The dish was wonderful, worth making. Cook’s notes: You will want to use a wide dish for this recipe so the filling can spread out in a shallow layer, which allows more water (from the fruit) to evaporate. Almonds are the first choice to complement the combination of nectarines and boysenberries, but walnuts or hazelnuts also work well. 1. Preheat the oven to 400°F. Butter a 3-quart baking dish (see cook’s notes). 2. Prepare topping: Mix flour, sugar, and salt together in a bowl. Add butter and toss until evenly coated. Using your fingertips or a pastry blender, cut in butter until mixture resembles crumbs. (Alternatively, you can put the dry ingredients in a food processor and pulse to combine. Add the butter and pulse until crumbly, then transfer to a bowl and squeeze the mixture between your fingers to make crumbs.) 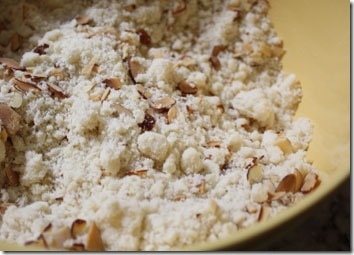 Add the almonds and mix gently; try not to break the almond slices. Put the topping in the freezer while you prepare the fruit filling. 3. Prepare fruit filling: Rub the sugar, cornstarch, and salt together in a large bowl. 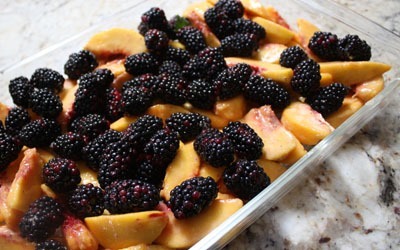 Add nectarines and boysenberries, toss until evenly coated, then gently stir in the vanilla. 4. Pour the fruit into prepared baking dish and scatter topping over the fruit. Bake for 45 to 55 minutes, or until topping is golden and fruit is bubbling. Cool for 30 minutes before serving, topped with ice cream or whipped cream, if desired. Wrapped in plastic wrap, the crisp will keep at room temperature for up to 3 days. Reheat in a 325-degree oven for 10 minutes before serving. Per Serving: 452 Calories; 19g Fat (37.3% calories from fat); 6g Protein; 67g Carbohydrate; 4g Dietary Fiber; 31mg Cholesterol; 388mg Sodium. luck finding an apple crisp without the oats. . .
and adventures–great writing and a wonderful spot to visit! ???? Isn’t that what we would call a ‘crumble’?